Fiona Denniff is a reluctant interview subject, insisting that she would rather let her horses do the talking for her. Indeed, the high-class pair Beat The Bank and Kachy – who lines up for the Betway All-Weather Sprint Championships at Lingfield on Friday after winning the Listed Cleves Stakes over course and distance last month – have not only spoken of the breeder's shrewd judgement, but positively shouted about it of late. Yet it would be regrettable if the remarkable story of how those horses were bred from a common ancestor who was picked up for a pittance was not documented in Denniff's own words, especially as she is such an engaging speaker as she warms to the subject. And so here is the account of how Denniff and her husband Mick have managed to found a mini-dynasty at their Nottinghamshire stud on a 3,000gns filly-in-training purchase, on the condition she is not made to sound boastful – a difficult promise to keep considering the events that unfolded would encourage even the most shy and retiring to showboat. Tiana, the dam of Beat The Bank, and Mary Read, the granddam of Kachy, are out of Hill Welcome, a daughter of Most Welcome bought for that modest sum at the now-defunct Lincoln Handicap Sale at Doncaster in 2001. Denniff takes up the tale. “Hill Welcome was only the second mare I'd ever bought,” she says. 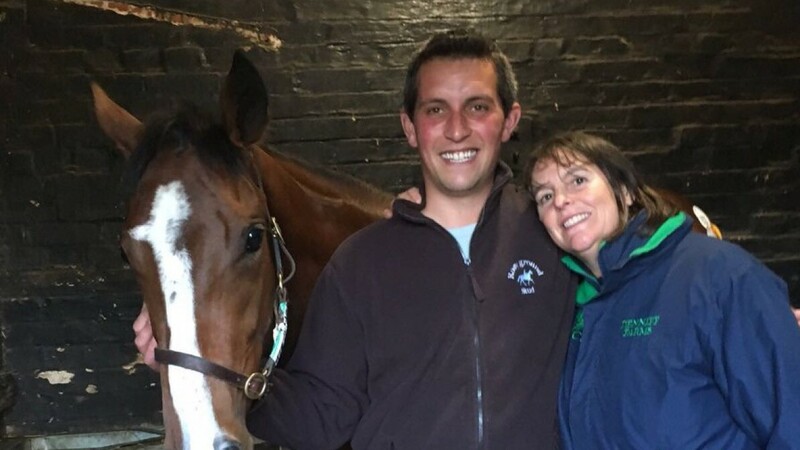 “I'd picked out the pedigree in the catalogue before we got to the sales and when we saw her we thought that although she wasn't very big, she walked amazingly, with a good overstep and great swagger. “There was another mare later in the sale I also liked but we decided to follow Hill Welcome into the ring. Bidding got stuck at 2,500gns so I offered 3,000gns – my one and only bid – and got her. That price-tag of 3,000gns is hard to fathom seeing as the mare is a half-sister to the 1985 Middle Park Stakes winner Stalker. “It was possibly because she wasn't the biggest mare,” reasons Denniff, who formerly bred competition horses, with Mick having produced the Hickstead Derby-winning showjumper Welham. Hill Welcome has made a mockery of her market valuation by producing ten winners from 12 runners for Denniff, three – Mary Read, Tiana and Above N Beyond - with black type to their name. Mary Read, her first foal by Bahamian Bounty, made an inauspicious start for the dam by misbehaving and selling for peanuts as a yearling at Tattersalls in 2003. Sent to Bryan Smart, Mary Read vindicated that decision as she was beaten a length or less when placed in the Hilary Needler Trophy, Molecomb Stakes and Harry Rosebery Stakes. At the end of the mare's racing career, Denniff bought out her co-owners and has bred two winners from her. What makes the feat of going on to breed Kachy and Beat The Bank from this family all the more astonishing is that their dams were, like Mary Read, bought back after being sold as yearlings. Dubai Bounty, by Dubai Destination out of Mary Read, was sold as a yearling for 50,000gns and won a Chester handicap before being bought by Denniff for 10,000gns as a four-year-old and carrying the breeder's silks to score again at Wolverhampton. She produced Kachy, a son of Kyllachy who was a Molecomb Stakes winner at two and beaten just a length by Quiet Reflection in the Commonwealth Cup at three, from her first mating. Hill Welcome's second foal Tiana, meanwhile, was a 90,000gns Doncaster yearling purchase by Darley, for whom she finished third in the Oh So Sharp Stakes. She had been sold to another party for 75,000gns as a three-year-old before Denniff reclaimed her homebred Diktat mare as a six-year-old at a cost of just 35,000gns. 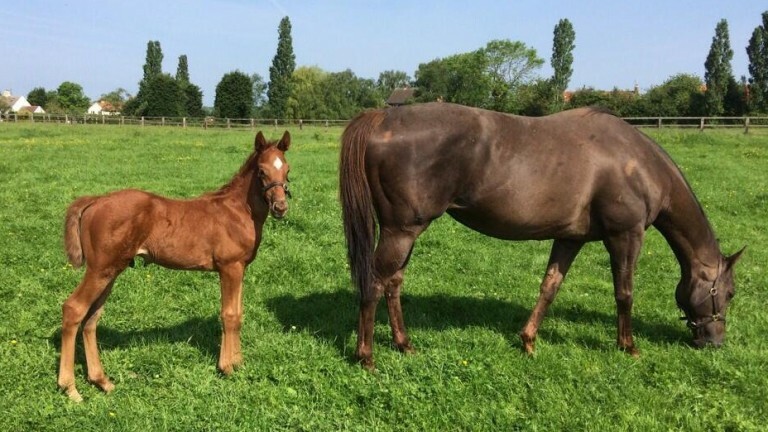 Tiana's fourth foal Salt Island, by Exceed And Excel, was fourth in Muhaarar's Commonwealth Cup, and two years later came Beat The Bank, a son of Paco Boy who landed five races in 2017 including the Joel Stakes by a stunning five lengths. The gelding is set to kick off his campaign in the Lockinge. Explaining the unusual feat of breeding, selling and then reacquiring the dams of two stakes winners, Denniff says: “We're a commercial operation and everything we breed is for sale. We don't have a policy of selling colts and keeping fillies because quite frankly we couldn't afford to do that. The result is that nine of the 15 broodmares owned by the Denniffs are members of the Hill Welcome clan, including the matriarch herself, still going strong at the age of 20. Only one had been retained as a long-term breeding prospect. "Hill Welcome is nothing like the top blue hen mares, I'm not silly enough to think that, but for a small stud like ours it's like having one. What she's done is incredible,” Denniff says. Matters became even more incredible at Tattersalls last year, when Tiana's yearling filly by Exceed And Excel – a sister to Salt Island – sold to Alastair Donald on behalf of Beat The Bank's owner King Power Racing for 500,000gns. That eclipsed the previous best price the Denniffs had achieved for one of their yearlings, the 160,000gns given for an Iffraaj colt from a different family in 2010. An appointment with Dubawi at Dalham Hall Stud this season has sealed Tiana's rise to royalty, in spite of being the product of a 3,000gns mare being mated on a £10,000 cover. She also delivered a filly by Muhaarar last Friday. Dubai Bounty, who has an Oasis Dream colt at foot, is booked into Showcasing, while Hill Welcome, who has produced a Twilight Son colt this season, was covered by Brazen Beau on Monday. Mary Read has this year produced a Charming Thought filly. “She is probably the nicest one she's had so far, so on that basis she's going back to the sire,” Denniff says. There could be more big paydays to come at the sales this year, as Tiana has a Showcasing yearling filly who is “the spitting image” of her half-sister who sold for 500,000gns, while Dubai Bounty has a yearling colt by Muhaarar. The lots will be prepped and sold on the Denniffs' behalf by Adam Hill at Rosyground Stud in Newmarket, who oversaw the sale of Chil Chil. Reflecting on the past 12 months, she sums up: “It's phenomenal for a small stud like ours. It's been really nice because other breeders have been congratulating us and saying – in the nicest possible way – if you can do it, so can we. Denniff may be a modest breeder of modest means, but with Beat The Bank and Kachy looking to keep her name in lights for a while longer yet - not to mention the future exploits of the Hill Welcome tribe - she might as well get used to the attention.